If you have been on your first visit to Sikkim then most probably it was in the eastern zone of this state. This is where the state’s capital Gangtok lies along with some great scenic locations like Tsomgo lake, Nathula pass, Tukla Valley, Zuluk (which is part of the historic Silk Route), Jelep La pass, and some sports bases like Rangpo and birding hubs like Mankhim. Read on to know more about the different tourist places in East Sikkim and what to expect there. Predictably any page about East Sikkim has to start off with Gangtok that’s Sikkim’s capital and undoubtedly its most glamorous buzzing city. Nestled at 1650 m above sea level… Gangtok has good nightlife, ample gaming experiences (it’s one of the few places in India where gambling is legalised), nice variety of local cuisine and plenty of spots around its vicinity to keep the average tourist occupied for at least 2 to 3 days. Once in Gangtok you cannot miss exploring the different city sights like Ganesh Tok, Hanuman Tok, Enchey Monastery, White Hall, Tashi View Point, and Himalayan Zoological Park along with Sa Nagor Center and other attractions. The famous Rumtek Monastery is 24 km away from Gangtok while the Sikkim Research Institute of Tibetology is quite near the Gangtok town in Deorali. The Do Drul Chorten and the Rustomji Deer Park are other notable attractions. A beautiful flower show is held at almost all throughout the year near the white hall and that’s a great place to spend some lovely hours while the ridge park above the Gangtok town is also a good place to take a stroll. The Changu Lake is 38 km away from Gangtok while the Nathula Pass is 54 km away. Another attraction is the beautiful Fambong La Sanctuary that’s 25 km away from town. 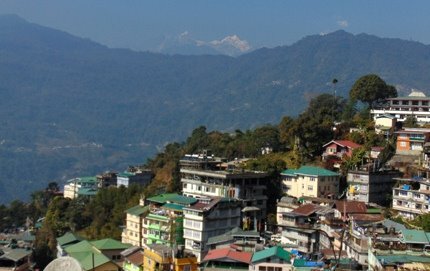 From the tourist point of view Gangtok offers an all-inclusive experience… a heady mix of shopping (MG Marg is easily Sikkim’s best shopping opportunity), food experiments (there are loads of restaurants here) and sightseeing. This is the best place to plan your tour around if you don’t want to venture into any remote areas and yet want to experience the Sikimese way of life. Best time to visit: Gangtok is an all year tourist destination but winters and spring are the more popular tourist slots. Location and Route: Gangtok is 120 km away from NJP (new Jalpaiguiri) and 124 km from Bagdogra airport while Darjeeling is 98 km away. You will get easy transport including buses, shared and private cabs from NJP to Gangtok and pre-paid reserved taxis from Bagdogra. Bagdogra airport also offers helicopter service to Gangtok. Read: Gangtok Tourism to know all about the town, its attractions, hotels, eateries and lot more. Located about 34kms from Gangtok, Yakten is a small village at an altitude of 5,300ft and known for its pine forests, rare orchids, beautiful birds and butterflies, with back drop of towering green mountains and magnificent views of Kanchenjunga snow peaks. There are a few homestays most of which are privately run by the local village families. One of the ideal things to do here is to take a village or a nature walk where you would walk through forests, pass by village huts, chat with the locals, hear the chirping of birds, watch butterflies and orchid gardens along the way. One such popular nature walk is to a place called Bojyetar – an open field area surrounded by pine trees. On the way back you will pass through forested trails. Some nice villages nearby to explore are Parakha village (where you can see paddy fields, visit a handicraft center, a small monastery etc), Barapathing village (enroute the old Machong monastery you reach the lovely Barapathing lake and adjacent paddy fields) and then Rolep village where you can walk along the bank of river Rolep. There are nice trekking trails that originate from Yakten. A 7km trek through pine forest takes you to Jhandi Dara – a view point from where you get stunning views of Mt. Kanchnejunga. There is another shorter trekking trail to the ruins of a Bhutia fort known as Budang Gari. While most homestays here are basic, they are clean, have attached western style toilet, provide hot water and offer organic Nepali food prepared with locally sourced ingredients. In breakfast you can expect paratha, sabji, milk, eggs etc. They make chicken in lunch and dinner. They can also organize campfire, locally handmade beer known as Tongba, and cultural dance in the evenings performed by the local village girls and boys. For booking a homestay in Yakten, you can contact +91 9804303054. Best time to visit: You can visit anytime of the year. However avoid monsoon (July – September) if you plan to trek. Location & Route: Yakten can be easily reached from Gangtok by a cab in about 1 hour 35 minutes (34kms) via Ranipool, Saramsa Garden and Pakyong. The new Pakyong Airport is only 10kms from Yakten. The Tsomgo Lake/ Changu Lake is just 35 km away from Gangtok and showcases a lovely reflection of the mountains in its crystal clear water. Interestingly this is one of the rare high altitude lakes in India. This lake was also a part of the ancient Indo China trade route. The typical scene at Changu Lake comprises of Yak rides all around the lake with a visit to the small shrine nearby combined with tea/ coffee/ Tibetan noodles at the small shops here. You can also check out the Kyongnosla Sanctuary nearby that has Himalayan Bears and Pandas besides a lovely collection of orchids. Nathu La Pass (altitude 13,123 feet) stands on the crossroads of the Indo Chinese border and it’s an offshoot of the old silk route…right now it manages a lot of tourist traffic like it used to manage trader traffic before. This place connects Sikkim to China owned Tibet Autonomous region and since 2006 it is acting as official border personnel meeting point. Nathula pass is located about 54 km east to Gangtok….you can either take a shared vehicle or a private one from an authorized tour operator to reach it. Only tough vehicles like Scorpio, Bolero etc can reach Nathula Pass as the roads are quite slippery and rough. You need to take a permit from the civil aviation department to visit Nathula Pass (a good travel agency can get it for you). The Baba Mandir is nestled between the Jelepla Pass and Nathula Pass. One can combine a visit to the Baba Mandir along with Nathula Pass and Tsomgo Lake. This mandir is a tribute to Harbhajan Singh…a former member of the Indian sentry who is considered to be a holy entity. People leave their water filled bottles here after which they are recollected (supposedly the spirit of the Baba blesses the water) and the water gains wish fulfilling characteristics. You should ideally stay in Gangtok and then plan a day trip to the above mentioned places as Nathula Pass, Baba Mandir and Changu Lake do not have tourist accommodations. Best Time to visit: June to September there are threats of landslides so it’s not an ideal time to visit the pass. Summers i.e. between April to mid-june and autumn i.e. between Octobers to November are the best season to visit. Tourists are not permitted to visit Nathula pass on Monday and Tuesday. Tukla Valley is a treasure house of beautiful scenery and views of snow-capped peaks including Kanchenjunga. The beauty of Tukla Valley is like that of the Tibetan highlands. Incidentally there is a memorial dedicated to British soldiers here who valiantly fought the battle of Tukla. This valley is completely pristine white with snow in late winters while in September and October the profusion of local blooms turns the valley red. Once you are in Tukla valley you need to see Jelep La Pass (means lovely level pass in Tibetan)... this pass is at an altitude of 13,999 feet and it connects Lhasa to India. This pass stands between eastern Sikkim zone and Tibet (which is now part of China). The pass extends for 46 meters and lies directly above the Menmecho Lake (this is 6 km away from Baba Mandir)... in spring the pass is also filled with rhodendrons. The Memencho Lake is surrounded by verdant pine forests and it’s fed by waters from the mountains of Jelep La. The Jelep La pass is part of the silk route which was used for trade of fur, spices, silk and wool between Tibet and India. Another must see attraction near Menmecho Lake is the almost royal blue Kupup lake that’s also called the Elephant Lake. Locals call it Bitan Cho that’s an important tourist destination of this area. The right side of the lake represents an elephant trunk while the left side represents an elephant’s tail. Read: Old Silk Route to get details about Kupup lake, Menmecho lake, Jelepla Pass etc. The Baba Mandir (old one) is at the end of a forked road from Tukla and it reportedly contains the Samadhi of Baba Harbhajan Singh. This Baba was an Indian soldier who died in a tragic accident in this area and reincarnated himself in the dreams of a fellow soldier demanding that a temple be built in his memory. The old Baba mandir generates a lot of interest but is difficult to reach... you need to climb up a steep flight of stairs to reach it. The new Baba Mandir is at the junction of Kupup Gnathang road and the trail to the Menmecho Lake... this one commands a lot more tourist interest and is also more accessible. Interestingly locals believe that Baba Harbhajan Singh guards the INDO China border. Read: Baba Mandir to know about both old and new baba mandirs. Many trekkers decide to explore the Younghusband's trek after seeing Kupup Lake…this is a trek that was used by British army in the past to conduct an invasion of Tibet. Best time to visit: the Kupup Lake, Tukla valley and Jelep La pass remains almost snowed under from January to end of April. May and June are the most beautiful months as the weather is good and the whole area has a floral carpet including the famed rhodenderons. Monsoons are not a good time to go trekking here but early winter and autumn (October - November) are also beautiful and suitable for treks. Location and Route: from Gangtok, the Kupup Lake is 62 km away and it will take you 2.5 hours to reach via the Jawaharlal lal Nehru road. From Lake Memencho the Tukla valley is only about 6 km away and the Baba Mandir (new) is 6 km away. The Jelep La Pass is about 11 km away from the Tukla valley. The Nathang valley (also known as Gnathang Valley) too is part of the legendary silk route… it stands at an altitude of 13,500 feet and was once the home of Tibetan yak herders. Many streams dissect the valley and lots of prayer flags flutter all around the edges of the mountains. It is said that this valley changes color and every season offers a new facet of its beauty. Just before winters, a flock of rare migratory birds visit the valley drawing in many ornithologists and photographers here. A small Hindu temple and an ancient monastery stand in the Nathang valley. From Nathang valley one can explore the nearby Sunrise view point that’s 20 minutes away (5kms)….there are two of them Eagles Nest Bunker (offers wonderful view of Kanchenjunga snow peaks, Bhutan, Tibet etc) and Sunrise View Point. Homestays run by the villagers have come up in Nathang valley. You have a choice of both traditional homestays (with wood burners) and modern homestays (with room heaters and water heaters using solar power). The homestays also offer TV, attached western style toilets etc. Some nice homestays in Nathang Valley includes Gnathang Residency (Phone: 094348 54141), Palzor Homestay (Phone: 097341 50546) etc. Best time to visit: The valley is covered with wild flowers between June to September. This is a great time to visit. The valley remain covered with snow between January to April. This is a great time too if you love to see snowing. Location and Route: Nathang Valley is 68kms from Gangtok along Jawaharlal Nehru Road. You will pass by Tsomgo Lake, Baba Mandir, Kupup to get to Nathang Valley. Rangpo is a pretty town in east Sikkim and bordering west Bengal. It’s situated right beside the Teesta River and is actually the first town in Sikkim NH 10 that connects Gangtok to siliguri. Rangpo is called the gateway to Sikkim and most vehicles entering Sikkim have to stop to validate their documents here. If you are fond of cycling then you can explore the most famous cycling trail of Sikkim that is from Gangtok to Rangpo…the trail passes through rugged Himalayan land alternating with fertile green stretches. Group cycling tours are organised in this route in autumn and spring. Rangpo also offers an exceptional river rafting experience…the raft will take you from the river point at Makha and then cross Sirwani before arriving at Rangpo. River rafting should only be done with the help of a trained professional preferably associated with a reputed private tour operator or a government one (you need to contact Sikkim tourism Office for this). The multicultural atmosphere in Rangpo (Nepalis, bhutias, Lepcha and marwaris coexist here) makes it interesting. A huge railway construction project is going on here for creating a rail route between Sevoke and Rangpo (this will improve the connectivity in Sikkim). Location and Route: Rangpo is 38.7 km away from Gangtok and you will reach here in about 1 hour 20 minutes via the Gangtok Rangpo Road. From Makha bazaar in Sikkim to Rangpo is 27.4 km (as mentioned this is an important rafting route). From bagdogra it will take you 2 hours 40 minutes to reach Rangpo (84 km) while from NJP Railway station the distance is 82 km. Mankhim is a beautiful hilltop in Dalapchand village that lies under Rongli division of east Sikkim. It’s an upcoming destination that’s famous for its mountain views and direct views of the emerald green Lamphokri Lake. Tourists travelling to Mankhim usually visit the nearby tourist spots like Silery Gaon, Pedong, Kalimpong and Reshikhola while others plan to visit high altitude golf course, Kupup Lake, Zuluk etc. in day trips. If you are an amateur trekker travelling with family or in a mixed group and want to explore the natural loveliness of Sikkim then visiting Mankhim is a good option. The highlight here is the 1.5 km long Mankhim to Aritar Lake trek which is a part of the ancient silk route. Bird watchers, families, children and even aged people can go on this trek which takes you through forest areas and exposes you to some glorious glimpses of Kanchenjunga. This is one of the most comfortable low altitude treks in east Sikkim. The trekking trail has railings and stone pavings which makes the path safe and in between you can find benches and trekkers shades. On the way to the Lampokhri lake there is a point called Love Dara that’s a nice picnic spot… you will see lots of bird watchers congregating here. Once you reach the lake you can enjoy paddle boating and try out rock climbing in the nearby hills. In case you are interested in a trek of a higher difficulty level then trying out the Mulkarkha lake trek in north Bengal is another option. Mankhim has a temple (Rai Hindu temple), Ram Gauri Sangrahalaya (unique combination of museum and nursery), Evergreen Nursery, cafeteria, restaurant and scant accommodation options. 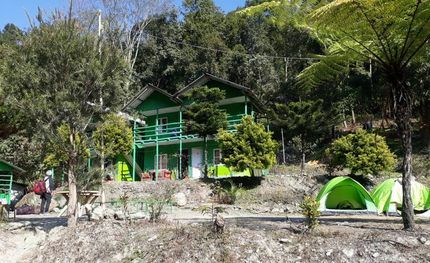 One of the best places to stay here is Kanchenjungha Mirror home stay that’s run by a Sikimese family…they offer food, accommodation, conveyance and sightseeing guides. Nearly 4 km away from Mankhim is Aritar…a relatively popular destination in Sikkim, Aritrar has an 1895 built Dak Bungalow that was built by Sir James Claude who was the first political officer posted in Sikkim by the British…this is also the site of Sikkim’s first treasury. The Dak Bungalow is now managed by the Heritage Bungalow Group and provides accommodation option to tourists at approximately 1500 INR per night. For a distinctly old world colonial experience you can opt for a stay here…you need to make the booking through the ‘Heritage Bungalows’ official website. The Aritrar Gumpa with its beautiful murals, carvings and manuscripts is another attraction. You can also see the Parbateyswar Shivalaya temple that’s nearby. Enroute to Aritrar near Rhenock bazaar there is Nirmal Dham. The Kali Khola falls is near the Rorathang Rongli road junction. Another spot to check out is the 50 meter high Chhangey Fall near Lampokhari. Best time to visit: this is an all season destination…however the best trekking experiences and sunrise views are available in winters. If you want to experience the Lampokhari tourism festival then plan a visit in March. Location and route: Mankhim is about 156 km away from siliguri and it’s possible to reach here in 4.5 hours. You need to start from teesta bazar and then cross Pedong, Reshikhola, Aritrar before you reach Mankhim. You can reach mankhim from Gangtok in 3 hours. 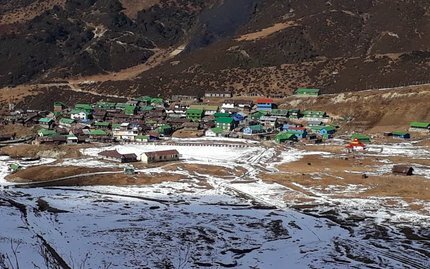 A destination that’s gained a lot of popularity in recent times is Zuluk (or Dzuluk) that stands at a height of 10,000 feet in lower Himalayas in east Sikkim. Zuluk was the first transit point in the silk trade route between India and Tibet. There is a small settlement here comprising of about 700 people along with an Indian army base. This is also the first place in the silk route that offers home stay facilities….you can stay here and explore nearby destinations like Kupup and Nathang Valley. Zuluk offers serenity, lovely views and hordes of summer rhododendrons. About 14 km away is the Thambi view point that offers a very nice view of the Kanchenjungha range (watching the sunrise here is a popular activity). You can also visit Lugthang from Zuluk…the road will make 32 hairpin turns in between. The Nag temple with its exotic snake God idol and mystic past is another attraction. Zuluk has rich diversity in fauna…the place is especially attractive to birdwatchers who can check out blood pheasants, snow pheasants, monal pheasants, Himalayan weasel etc. here. This area also has red pandas and deers. If you want to explore Zuluk and the historic silk route you will need a permit that can either be issued from Rongli or Gangtok when you show ID Proof and photos. Your tour operator can also arrange the permits for you. Foreigners are not allowed to visit Zuluk for security reasons... it's a border area with China. There are locals in the village who offer homestay facilities for tourists... there isn’t any proper hotel in this area. From Zuluk you can explore other high altitude destinations like Gnathang valley, Tsongmo Lake, Kupup and Nathu La Region. Best time to visit: From August to October the whole region is covered with wildflowers. From January to April there is a snow blanket on Zuluk. The rainy season falls between May to July and is best avoided. In October the famous Dashain and Tihar festivals takes place here. The weather is chilly the whole year around so you need to carry along plenty of woollens. Location and route: From gangtok reaching Zuluk will take 4 hours…you will cross kupup and nathang valley enroute. You can also visit Zuluk from Kalimipong and cross aritar, Padamchen enroute (mostly you have to follow the Jawaharlal Nehru road). Read: Zuluk and the historic silk route to get complete information about the place and how to visit. 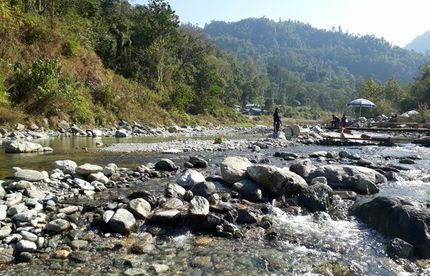 About 37 km from Kalimpong lies the riverside retreat of Reshikhola. This place gets its name from the river Reshi. In Nepali the word Khola means a small stream. Reshi Khola lies between Sikkim and west Bengal though technically it’s a part of east Sikkim. The river valley is flanked by forests on all sides and these are filled with birds making it a paradise for ornithologists and birders. Recently this place has become an eco-tourism hub…several homestays have opened up along the river banks and the tourists indulge in fishing and nature watching. From Reshi Khola tourists visit Pedong and Silerygaon along with Kaagey, Mankhim village and Aritar. Reshikhola is just 2000 feet above sea level…it’s not too cold here. You can trek to the Kupup Lake, Baba Mandir etc from Reshi. Another popular accommodation here is Reshi River Resort located by the river side. Phone: 9933489825. 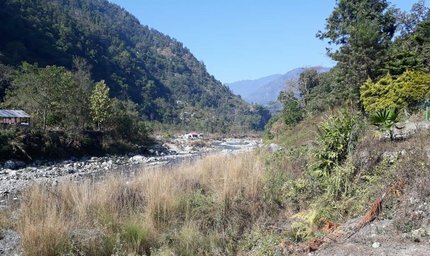 Best Time to visit: you can visit Reshi Khola at any time of the year…it’s never too chilly here. However winters are the best season for trekking. 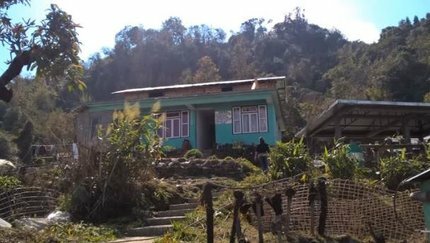 Location and Route: Reshi is 44 km from Kalimpong and 100 km from NJP…enroute you will cross Pedong an upcoming tourist spot of Bengal. The distance from Gangtok to Reshi Khola is about 59kms and takes around 2 hrs 20 minutes by car. From Gangtok you need to come down to Rangpo and then turn towards Rorathang and then towards Rhenock Bazar to reach Reshi Khola. From NJP, Siliguri, Kalimpong and Gangtok you can get private taxis to Reshi Khola. Hi, I want to know that Nathula Pass, Baba Manidr and Tsomgo Lake can be done in a single day? Yes it can be done. The three spots come under a standard day package offered by the tour operators.